Amazon Price: $12.94 $12.94 (as of February 2, 2019 7:53 am – Details). Product prices and availability are accurate as of the date/time indicated and are subject to change. Any price and availability information displayed on the Amazon site at the time of purchase will apply to the purchase of this product. Measuring 13″ across and 17″ high, this red, nylon canvas bag features a furry front with Domo’s facel! This soft bag also features drawstring cords perfect for carrying or slingin’ around your shoulders and..uh..carryin’ stuff! 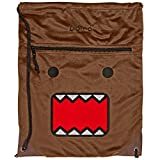 What would Domo use this bag for? Why, for carrying along potatoes and snacks. Why? Because he can.